12 SMOKESHOP August 2016 NEWS >>>TRENDS & TRENDSETTERS IN TOBACCO RETAILING Retailing > Davidoff has opened its fifth company-owned flag- ship store and cigar lounge in Houston, Texas. Davidoff of Geneva–Since 1911 Houston occupies a 2,000 sq. ft. premium space in Oliver McMillan's upscale River Oaks District, a luxury retail center located in the Houston loop. The store features a premium cigar retail space, walk-in humi- dor, a luxury lounge, and private lockers available for lease. The space features a selection of custom art created by Dominican artist Fausto Ortiz. > Miami native and local attorney Carlos Padron is combining his love of craft beer and cigars at the open- ing of The Tank Brewing Co. this summer. The 25,000 sq. ft. facility will feature a brewhouse, private tasting room, quality test room, barrel aging room, huge tap room for beer drinkers, and a retail cigar shop, reports the South Florida Business Journal. > Owner Jim Benton and a group of partners recently opened The Cigar Shop in Monroe, Conn. at the site of the former Up In Smoke shop, following extensive renovations. The comfortable shop fea- tures flat-screen TVs, wi-fi, and comfortable seating providing a casual BYOB pipe and cigar lounge that Benton describes as an extension of his customer's living rooms. 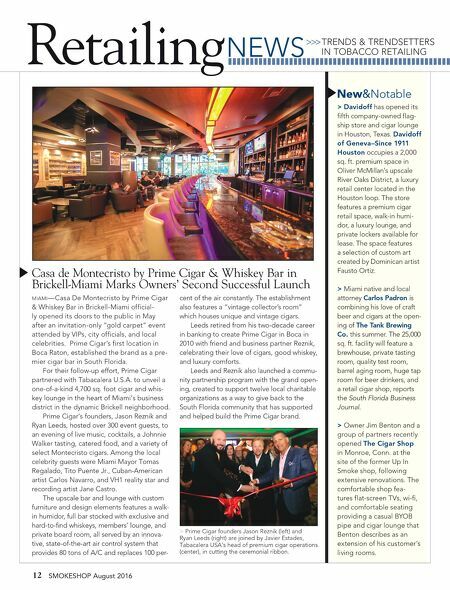 Retailing New&Notable miami—Casa De Montecristo by Prime Cigar & Whiskey Bar in Brickell-Miami official- ly opened its doors to the public in May after an invitation-only "gold carpet" event attended by VIPs, city officials, and local celebrities. Prime Cigar's first location in Boca Raton, established the brand as a pre- mier cigar bar in South Florida. For their follow-up effort, Prime Cigar partnered with Tabacalera U.S.A. to unveil a one-of-a-kind 4,700 sq. foot cigar and whis- key lounge in the heart of Miami's business district in the dynamic Brickell neighborhood. Prime Cigar's founders, Jason Reznik and Ryan Leeds, hosted over 300 event guests, to an evening of live music, cocktails, a Johnnie Walker tasting, catered food, and a variety of select Montecristo cigars. Among the local celebrity guests were Miami Mayor Tomas Regalado, Tito Puente Jr., Cuban-American artist Carlos Navarro, and VH1 reality star and recording artist Jane Castro. The upscale bar and lounge with custom furniture and design elements features a walk- in humidor, full bar stocked with exclusive and hard-to-find whiskeys, members' lounge, and private board room, all served by an innova- tive, state-of-the-art air control system that provides 80 tons of A/C and replaces 100 per- cent of the air constantly. The establishment also features a "vintage collector's room" which houses unique and vintage cigars. Leeds retired from his two-decade career in banking to create Prime Cigar in Boca in 2010 with friend and business partner Reznik, celebrating their love of cigars, good whiskey, and luxury comforts. 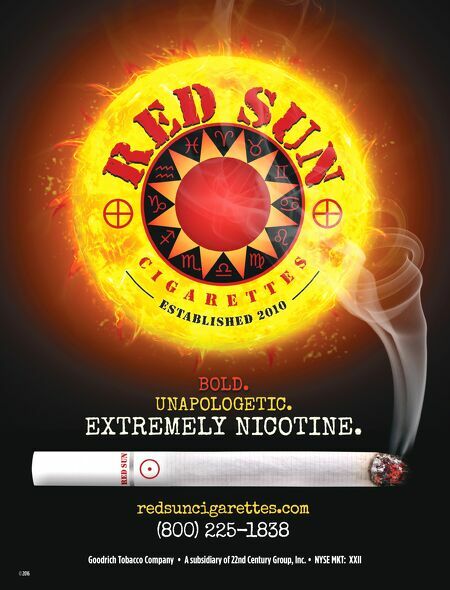 Leeds and Reznik also launched a commu- nity partnership program with the grand open- ing, created to support twelve local charitable organizations as a way to give back to the South Florida community that has supported and helped build the Prime Cigar brand. Casa de Montecristo by Prime Cigar & Whiskey Bar in Brickell-Miami Marks Owners' Second Successful Launch > Prime Cigar founders Jason Reznik (left) and Ryan Leeds (right) are joined by Javier Estades, Tabacalera USA's head of premium cigar operations (center), in cutting the ceremonial ribbon.